The chubby cherub with his bow and quiver, favorite image on Valentines, bears little resemblance to the earliest conceptions of Eros, the Greek god of love. His origins are obscure; some say that He was hatched from a silver egg laid in the womb of darkness. Later it was claimed that He was the son of Aphrodite and variously named gods including: Ares, Zeus and Hermes. But long before Aphrodite was imported into the Olympian pantheon, the Greeks worshipped a god of sexual potency named Eros in the form of a standing stone at Thespiae in Boeotia. Hesiod makes Eros one of the oldest of the gods, representing Him as the powerful seminal force that attracts and unites the cosmic forces creating the universe, "bringing harmony to chaos" and enabling life to exist. This lovely statue is cast in resin and hand finished. He stands 8 3/4 inches tall. 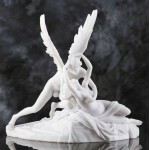 Item Number: MT-EROS | Approximate Size (Inches): 3.00 wide x 4.00 deep x 8.75 high | Approximate Shipping Weight: 2.25 lbs.